As I sit typing this, I still can't believe that I'm already into my second trimester. It seems like both a life time and a blink of an eye ago that I saw those 2 pink lines, and felt the first bubbles of excitement (and nerves). I wanted to document these special moments, even if it's only me and my husband who reads them. I think the hardest part of the first 12 weeks is keeping it a secret. To not be able to tell people that you feel like you just want to sleep for 24 hours straight, or that you're not intentionally (ok you are, but you catch my drift!) avoiding social gatherings involving alcohol is quite the challenge! I really wanted to tell the world as soon as we found out, but the worrier in me also was frightened of all the things that could go wrong (I still am to be honest). I'm not going to complain too much about sickness, as in all honesty, I've probably had what some would say is an easy ride. I didn't have any sickness until after 9 weeks, and even then it was mostly in the evenings. I would be fine all day at work, maybe the odd wave of nausea just before and after eating, then feel worse as the afternoon went on. Luckily for me, I would just go to bed early, which did help a lot. The hot weather has made the sickness feeling flare up again recently though, and I'm finding it difficult to keep cool! I have slept a lot. A lot a lot a lot. I have been the nap queen. I haven't napped so much since when I was at university and I would always schedule an afternoon nap. I've really felt the effects of exhaustion on a whole other level. I used to hear others talk about the tiredness, and would think how bad can it really be? Well now I understand. I'm starting to feel a bit better now I'm into my second trimester (but I do still want a nap now and again). The first trimester though, I could easily nap for a few hours and then go to bed at 10pm again. I'm very fortunate my husband has helped out a lot, doing the food shop on his own and sorting dinner etc just so I can sleep. For most of the first trimester I really lost my appetite, and it's only just starting to rear it's head a little now. The thought of food turned my stomach, and I could just about manage to eat a sandwich. I haven't really had any cravings either, instead I've found I just want plain things, like ready salted crisps. Not the most healthy option, but needs must. 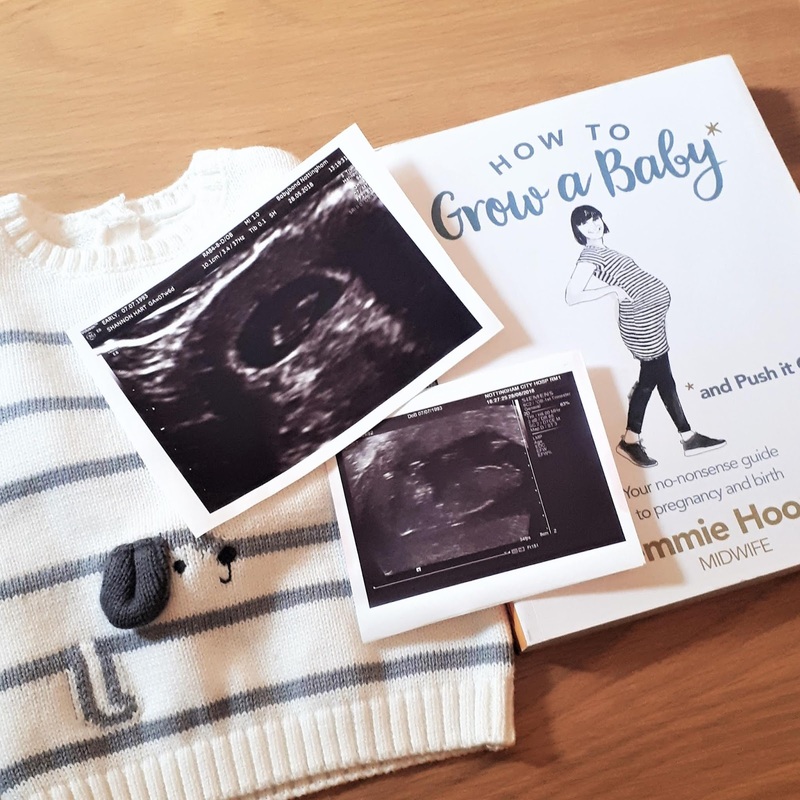 The wait for the 12 week mark just seemed like such a long way off, and I was already feeling very anxious, so we decided to take the plunge and book an early scan. 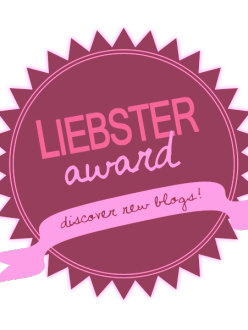 We chose Mother Care Baby Bond, and I have to say I was hugely impressed with them. They made me feel really at ease and relaxed, and it was a lovely moment to see our tiny little dot there on the screen. I was around 7 weeks pregnant at that time, so there wasn't a whole lot the technician could tell us, but we did see our little ones heart beating away. That was comfort enough. 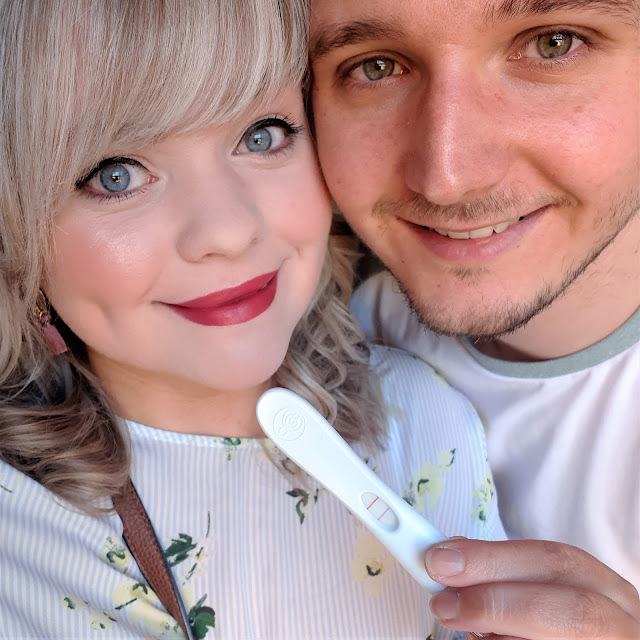 They aren't the cheapest of things, ours cost £89, but I did feel a weight lifted off my shoulders to know that the baby was indeed there, and matched up to what we thought we were date wise. I didn't buy much at all in the first trimester. I picked up some of the Pregnacare Vitamins to try and get some of the goodness into what was a very bland diet. 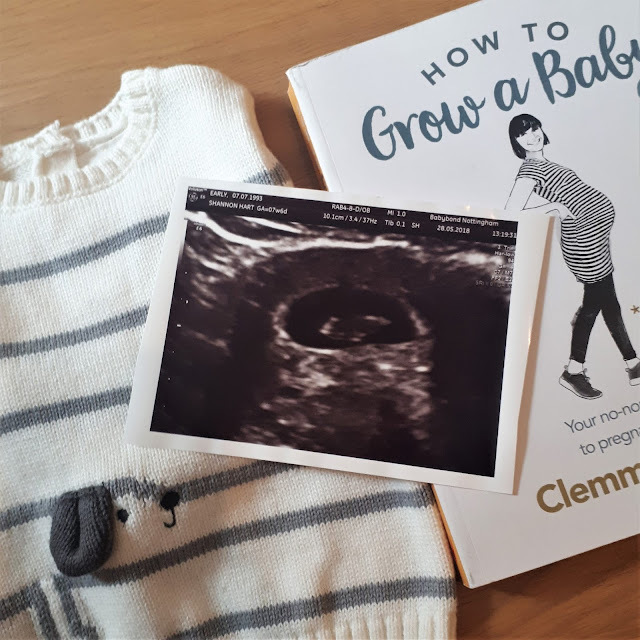 I also picked up Clemmie's 'How to grow a baby and push it out' book, and I have to say I really love it! Definitely would recommend if you're looking for some witty yet informative pregnancy reading. So there we have it, my first trimester summed up- night time nausea, nap queen and ready salted crisp fiend. 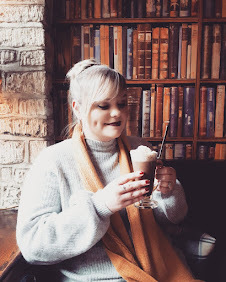 I hope you've enjoyed a little peak into my experience of the first trimester. I'm so excited to be in to the second, and very much looking forward to gaining some much needed energy back!